I was having trouble coming up with something to blog about today and found emails with some fun photos to share. OH! If you were a person who emailed me recently who was in Mark Martell's ornithology class a couple of years ago and sent me photos to identify, they are of a red-tailed hawk. I can't find the email anywhere in my in box. Larry Sirvio sent me this photo from banding at Carpenter Nature Center last Friday. Hey, all you parents in the Twin Cities or near the Minnesota border in Wisconsin who have kids home for the Holiday vacation looking for something to do--consider taking a visit to Carpenter on Friday mornings for banding. That is some major chickadee attitude! Check out the cowlick on the back of its head. I'm trying to get all my errands done during the week and my reward is going banding on Friday. Here's the poor guy getting mobbed by a red-winged blackbird. I know how annoying deer flies can be, I can't imagine how irritating a blackbird would be buzzing around your head. 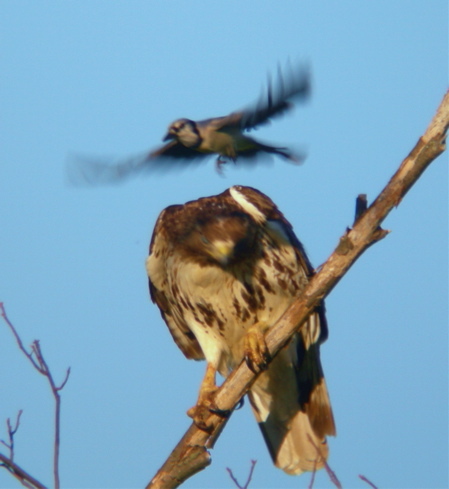 Some wonder about the intelligence of a bird so small attacking a predatory bird so large. 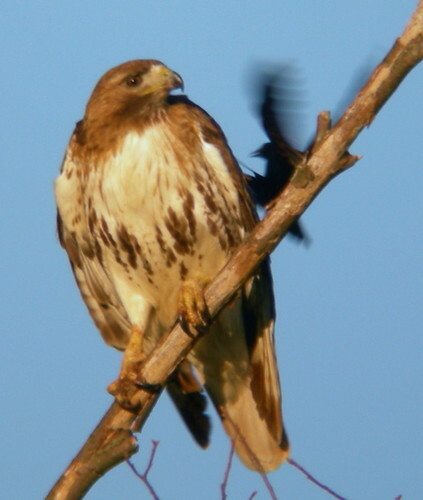 But the red-wing is much faster and rarely will get nailed by the slower moving red-tail. When defending a nest, a red-winged blackbird will attack almost anything. Not to be left out, a blue jay gets involved. Many people get angry when blue jays appear at the feeder, but these guys will take one for the team by mobbing and attacking predators. They will do this for Cooper's hawks (more likely to eat the birds at your feeder) as well as red-tails. It's always good to cut a blue jay a little slack. I think this shot deserves a caption contest. 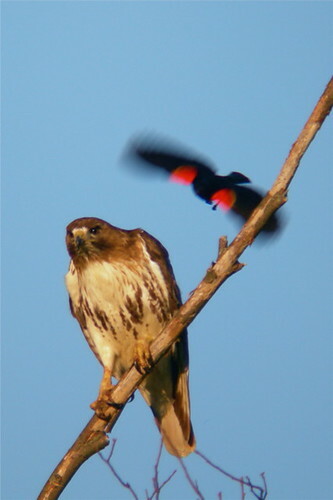 What is the red-tailed hawk thinking in this photo? The best funny answer with a name attached to it in the comments sections wins. Hmmm, what should the prize be? Oh! I just got some veggie suet pellets to try out (a whole case, as a matter of fact). Okay, so the funniest answer gets your choice of a veggie suet pellet flavor to try: fruit, berry or insect...does adding insects to veggie suet still make it vegetarian?